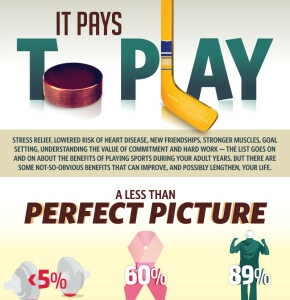 It pays to play when it comes to playing sports, especially the health benefits, lifestyle boost and sense of overall wellbeing. Sophia Barber from Sports-management-degrees.com shared a new Infographic titled “It Pays to Play” with the Sports Techie community blog. I like this content because of the positives playing sport provides people and the new data that backs up how important it can be to leading a balanced life, fulfilling career, and mental plus physical wellbeing. Sports technology has become a seamless and impactful component that contributes to sports performance, a healthy lifestyle and mental longevity. Some of these Infographic Big Data statistics are staggering. Less than 5 percent of adults exercise and perform fitness activities for 30 minutes a day. I get why for the most part but this has to change for all. Women have a remarkable 60 percent less risk of getting breast cancer it you exercise 4 times a week. Something every Sports Techie should remember from childhood is how exercising leaves you feeling euphoric. An impressive 89% of polled American adults responded they felt like a 7 after playing sport on a scale of 1-10. All sports play fire synapse in the brain causing new connections to occur, some sport more than others but all are good brain food. Being a lifetime learner applies to sports too. Adults who exercise and play sport frequently reap the benefits laid out in the Infographic and those who do not can still get the same if you start taking part in sports activity today. Tennis helps with mental acuity and improves resting heart rate. My Sports Techie Dad/Grandpa has the kind of RHR that Bjorn Borg has in the 40’s so I know what it takes to get there and hope to follow in their footsteps. Nearly 10 percent of the U.S. population play golf, including one of my brothers who loves the sport like I love sports tech. Walking 18 holes with no cart and carrying a full set of clubs on a hot summer day is superstar exercise. To have the patience to improve every time out is the real mark of a mental giant. It is significant that 73 percent of corporate executives played team sports because they are the ones in leadership roles in business. The 73 percent also know the value of recreational activities, a sport filled lifestyle and fair competition. Being born nearly 50 years ago makes it hard for me to understand that 65 percent of fellow Americans do not know how to swim for whatever the reasons. I am going to ponder this disturbing fact and make it a priority for Sports Techie to emphasize swimming sports technology as a way to give back to this beautiful sport. I wish the feeling of awareness in water while swimming could be had by every Sports Techie not only in the U.S. but all over the world. On a scale on 1-10 I feel like I can swim like an 8 after years of swim lessons as a kid at the YMCA and swimming as an adult in pools or outside in nature. Our baby son will be in the minority when he learns to swim like a fish in a few years. Thank the Chinese XIA Dynasty and 4,000 years of Martial Arts tweaks to get to 2014 where traditional disciplines like karate and judo are going strong and have been morphed into MMA disciples like the UFC and Bellator MMA. 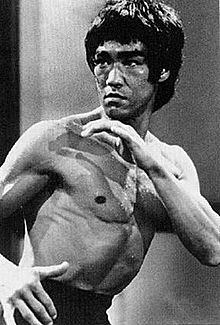 Martial arts is very gender neutral making this sport appealing to both women and men. Our Sports Techie community gratitude goes out again to Sophia for sharing the sports management Infographic. Sports Techie, One of my roles as the curator of our online community is to decide what topics to blog about and a constant theme I have been passionate about is playing sport, whether you are an adult or youth. My Mother and Father played basketball at high-levels half a century ago to influence our family. My brothers, friends and I grew up playing practically every team and solo sport and even invented our own sports like knee hockey, tennis lacrosse and MT bike polo, a quarter century ago. My 10 month old has seen more live sporting events on TV or mobile devices than I had before the onset of ESPN in 1979 when I was a fresh 13 year old teenager so what he will be capable of doing with sports tech at his side makes the future bright for him and other children who are steered towards playing sport. If it is stress relief, a lowered risk of heart disease, making new friendships, developing stronger muscles, baby steps goal setting, or understanding the value of commitment and hard work — the benefits of playing sports during your adult years is backed up by Big Data that could ultimately lengthen your life. Tensions can actually run high playing organized team sports. Adult softball, basketball and soccer leagues are fun and I encourage anyone to sign up and play but be sure to join a squad at your talent level and competition desire. Last thing you want to do is sign up for a men’s or coed team and find out all anyone cares about is winning when you were hoping for a team that cared more about having fun like my Sauceball league friends do in Seattle than playing each pitch like its the last one; especially when you are not a professional or scholarship player. Sport is indeed the fountain of youth. Use the box located on the upper right corner of every blog page to search any keyword or click on the keywords tag links below.